What are Blow Molding Machines? Blow molding Machines ( BrE moulding ) is a manufacturing process by which hollow plastic parts are formed. In general, there are three main types of blow molding: extrusion blow molding, injection blow molding, and injection stretch blow molding. The blow molding process begins with melting down the plastic and forming it into a parison or in the case of injection and injection stretch blow moulding (ISB) a preform. The parison is a tube-like piece of plastic with a hole in one end through which compressed air can pass. The process principle comes from the idea of glassblowing. Ferngren and Kopitke produced a blow molding machine and sold it to Hartford Empire Company in 1938. This was the beginning of the commercial blow molding process. During the 1940s the variety and number of products was still very limited and therefore blow molding did not take off until later. Once the variety and production rates went up the number of products created followed soon afterwards. The technical mechanisms needed to produce hollow bodied workpieces using the blowing technique were established very early on. Because glass is very breakable, after the introduction of plastic, plastic was being used to replace glass in some cases. The first mass production of plastic bottles was done in America in 1939. Germany started using this technology a little bit later, but is currently one of the leading manufacturers of blow molding machines. In the United States soft drink industry, the number of plastic containers went from zero in 1977 to ten billion pieces in 1999. Today, even a greater number of products are blown and it is expected to keep increasing. For amorphous metals, also known as bulk metallic glasses (BMGs), blow molding has been recently demonstrated under pressures and temperatures comparable to plastic blow molding. In Extrusion Blow Moulding Machines (EBM), plastic is melted and extruded into a hollow tube (a parison). This parison is then captured by closing it into a cooled metal mold. Air is then blown into the parison, inflating it into the shape of the hollow bottle, container, or part. After the plastic has cooled sufficiently, the mold is opened and the part is ejected. 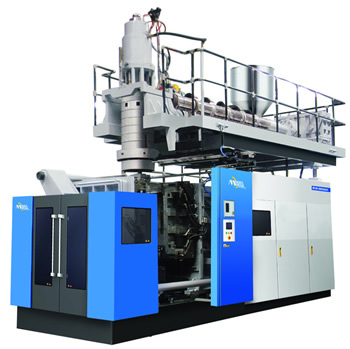 Continuous and Intermittent are two variations of Extrusion Blow Molding Machines. In Continuous Extrusion Blow Molding Machines the parison is extruded continuously and the individual parts are cut off by a suitable knife. In Intermittent blow molding there are two processes: straight intermittent is similar to injection molding whereby the screw turns, then stops and pushes the melt out. With the accumulator method, an accumulator gathers melted plastic and when the previous mold has cooled and enough plastic has accumulated, a rod pushes the melted plastic and forms the parison. In this case the screw may turn continuously or intermittently. with continuous extrusion the weight of the parison drags the parison and makes calibrating the wall thickness difficult. The accumulator head or reciprocating screw methods use hydraulic systems to push the parison out quickly reducing the effect of the weight and allowing precise control over the wall thickness by adjusting the die gap with a parison programming device. Advantages of blow molding machines include: low tool and die cost; fast production rates; ability to mold complex part; Handles can be incorporated in the design. The process of injection blow molding machines (IBM) is used for the production of hollow glass and plastic objects in large quantities. In the IBM process, the polymer is injection molded onto a core pin; then the core pin is rotated to a blow molding station to be inflated and cooled. This is the least-used of the three blow molding processes, and is typically used to make small medical and single serve bottles. The process is divided into three steps: injection, blowing and ejection. The injection blow molding machines is based on an extruder barrel and screw assembly which melts the polymer. The molten polymer is fed into a hot runner manifold where it is injected through nozzles into a heated cavity and core pin. The cavity mold forms the external shape and is clamped around a core rod which forms the internal shape of the preform. The preform consists of a fully formed bottle/jar neck with a thick tube of polymer attached, which will form the body. similar in appearance to a test tube with a threaded neck. The preform mold opens and the core rod is rotated and clamped into the hollow, chilled blow mold. The end of the core rod opens and allows compressed air into the preform, which inflates it to the finished article shape. After a cooling period the blow mold opens and the core rod is rotated to the ejection position. The finished article is stripped off the core rod and as an option can be leak-tested prior to packing. 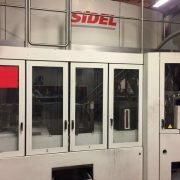 The preform and blow mold can have many cavities, typically three to sixteen depending on the article size and the required output. There are three sets of core rods, which allow concurrent preform injection, blow molding and ejection. Advantages: It produces an injection moulded neck for accuracy. Disadvantages: only suits small capacity bottles as it is difficult to control the base centre during blowing. No increase in barrier strength as the material is not biaxially stretched. Handles can’t be incorporated. This has two main different methods, namely Single-stage and two-stage process. Single-stage process is again broken down into 3-station and 4-station machines. In the two-stage injection stretch blow molding process, the plastic is first molded into a “preform” using the injection molding process. These preforms are produced with the necks of the bottles, including threads (the “finish”) on one end. These preforms are packaged, and fed later (after cooling) into a reheat stretch blow molding machine. In the ISB process, the preforms are heated (typically using infrared heaters) above their glass transition temperature, then blown using high-pressure air into bottles using metal blow molds. The preform is always stretched with a core rod as part of the process. 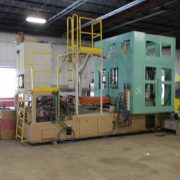 ← What are Injection Molding Machines?